Adopting a child offers difficult but rewarding challenges. 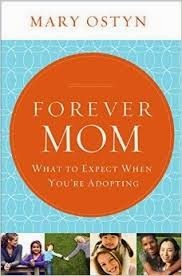 The book Forever Mom takes a look at some of the issues that surround adoption -- both in the processes that are required to adopt a child and also those that arise after bringing the child home. Mary Ostyn and her husband already had four birth children when they looked into adoption. It was very interesting to read about the struggles that they went through in attempting to identify a child to adopt. They had to decide between international and domestic adoptions, as well as the age of child they'd be willing to take. The first child they adopted, a boy from Korea, had lived with a foster family since birth and was easily assimilated into their family. When they decided to adopt another child from Korea, this child had a disability and had spent his first 7 months in a hospital. Due to the lack of nurturing, he didn't bond with the family as quickly. Later, when they decided to try domestic adoption, the author had close contact with a birth mother and was even present at the birth before the mother decided she wasn't able to give up her baby. Even after that heart-breaking situation, the family went on to adopt more children internationally. There is a great deal of practical and useful advice, including how to start an adoption fund, choosing a reliable agency to work with, how to prepare for a home visit, getting your children ready for the new family member, and adoption-related websites that offer support and information. The author believes that the chapter she includes on attachment is the most important in the whole book, and that's likely true. The adoptive parents haven't been around for the first part of the child's life, and due to the type of care the child has received up to this point, he or she might experience difficulties in bonding or adjusting to the new home. Since the author experienced this situation with her own son, she is able to give advice grounded in experience to help people who may also be dealing with bonding difficulties. There is also an excellent chapter on how to correct and discipline adoptive children, when they are coming from backgrounds that mean that traditional reward/punitive disciple strategies do not work. It's helpful that the author can look back on her own mistakes and interpret them in a way that may be useful to others. I think that anyone who is interested in beginning the adoption journey would enjoy this book. It's very enlightening to read about the struggles and mistakes that the author made while at the same time reading about the joy that her adoptive children have brought to the family.